Spring is finally here! Which means it’s time for chicks and spring coop cleaning. If you are like me, you may be looking for some extra-awesome ways to spruce up your chicken coop this year. Well, I’ve got you covered! I searched the internet high and low and let me tell you, there are some genius chicken lovers out there! It was so hard to narrow this list down to just ten amazing DIY’s that will take your coop to the next level! Click on the image to check out each of these awesome chicken coop hacks! These grazing frames from The Garden Coop are pure genius! 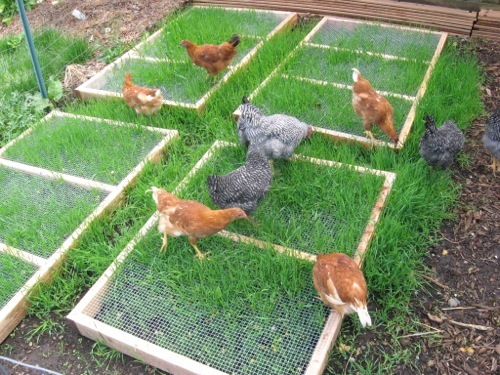 They allow chickens access to the tips of grass or other yummy sprouts while protecting the plant roots from being gobbled up! They would be easy to make with simple wood framing and mesh wire and there are step-by-step instructions on how to make your own! 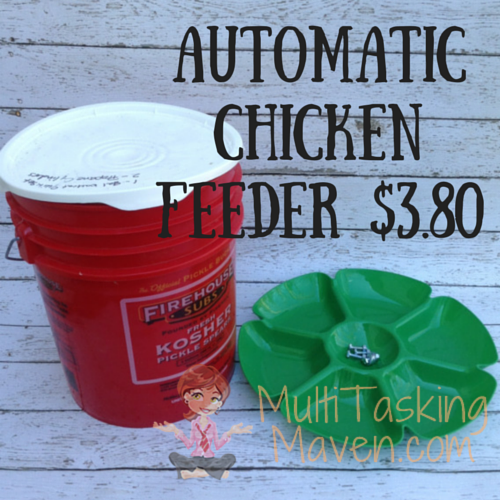 MultitaskingMaven.com shares an excellent tutorial that walks you through how to make a chicken feeder using a 5-gallon bucket and a plastic condiment platter. I love this so much that I think I am actually going to bust one out this weekend using all those extra buckets we have lying around! Let’s talk poop for a second: We all know that chicken poop – if you can catch it – is a huge resource for you garden and homestead. The tricky part is catching it! Lucy Brown shared her simple method for catching all that poo on Mother Earth News. This is seriously so simple – all you need is a plastic container and some wire! There is some serious shabby chic goodness going on at Shabby Olde Potting Shed! From dressers transformed into nesting boxes to battery-operated mason jar sconces, this is one fab chicken coop! 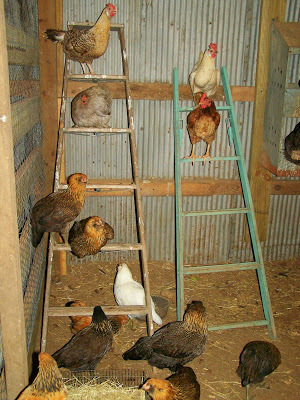 These rustic ladder roosts are my favorite! They are adorable and functional! You better believe I will be watching for ladders at the flea markets this summer! This awesome chicken coop design was shared on the Backyard Chickens member pages. 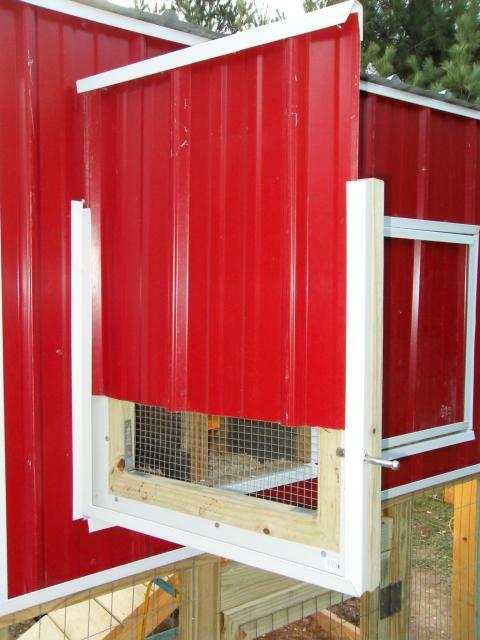 This chicken coop incorporates a lot of function designs including removable door panels. They can be removed to allow for air circulation or replaced for safety and temperature control. Check out their entire post to see what other cool hacks they incorporated into their coop! 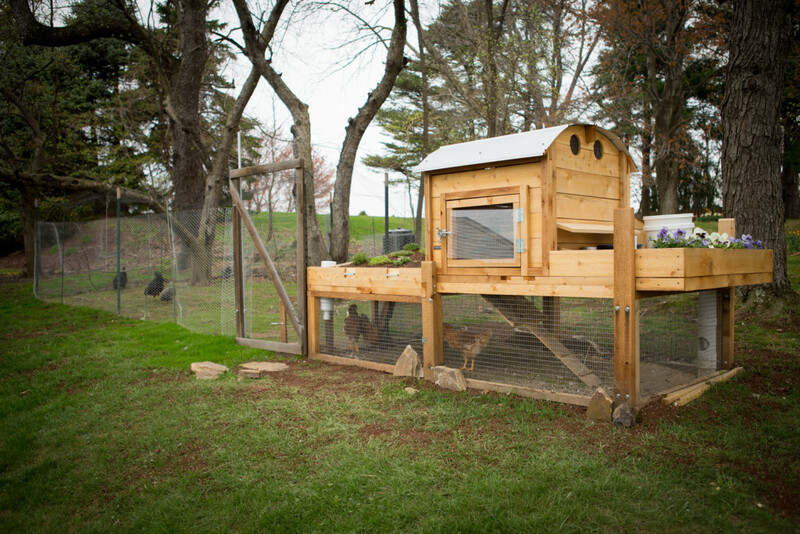 Cluck Wild Homestead incorporates some big style into their little chicken coop! 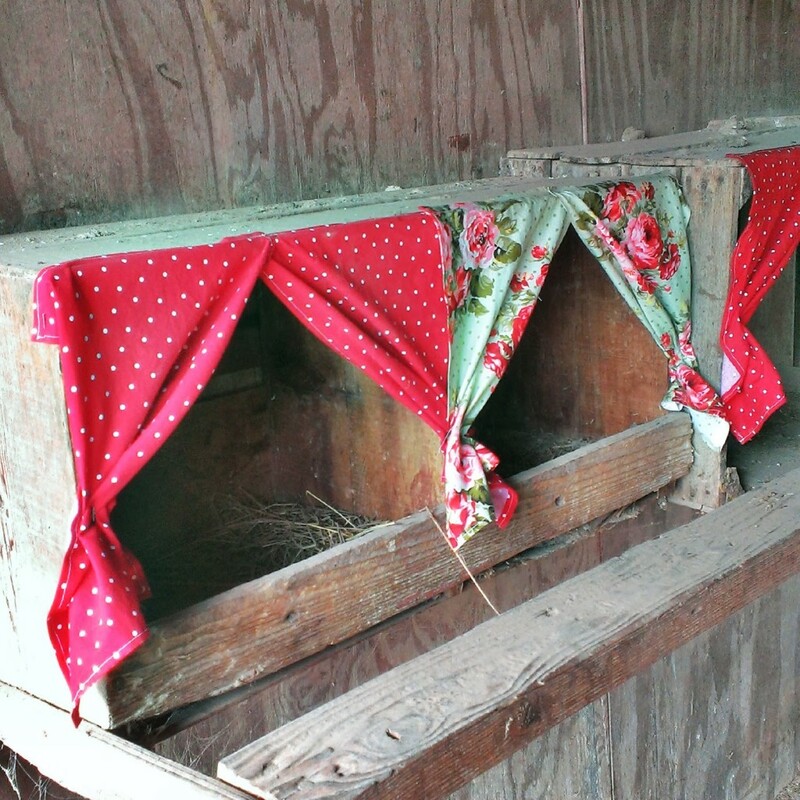 Putting drapes on nesting boxes can help reduce unwanted broodiness among your hens, and now you can do it in style! I can’t wait to dig out some scrap fabric and make these for our boxes! She even shares the measurements and instructions to make these adorable chicken nest box curtains! You’ve heard of porch swings… well, this is a perch swing! And it doesn’t get much easier to make – all you need is an old tree branch and some rope! 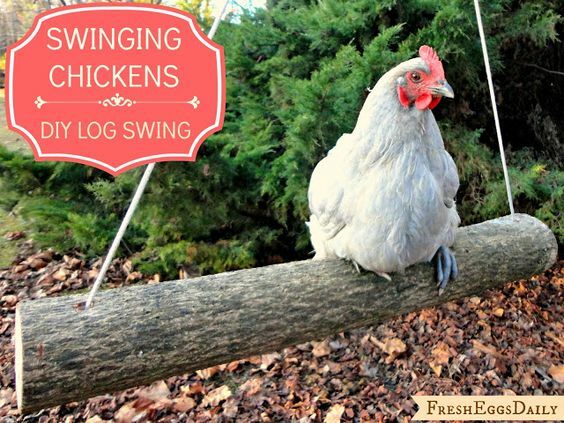 Fresh Eggs Daily has the full scoop on how to make your own chicken perch swing! Using the roof of your chicken coop for extra growing space is one of my favorite new ideas. It utilizes otherwise wasted space to allow you some extra room to grow greens either for yourself or your chickens. Primal Palate has shared their step-by-step instructions for this amazing roof top garden! The plan that is shared takes a little building know-how, but even a beginner could hack out a smaller-scale version. 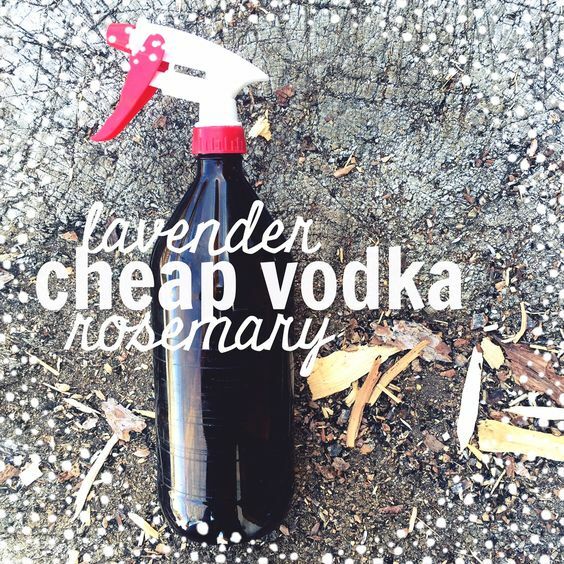 This DIY coop spray utilizes simple ingredients – essential oils and vodka – to form a great-smelling anti-bacterial coop spray. I am definitely going to whip up a batch to try out in our coop. Get can check out the full instructions and recipe at Camp Wander! I realize that this DIY treat dispenser was originally designed with dogs in mind, but I would love to make one for our chicken coop! 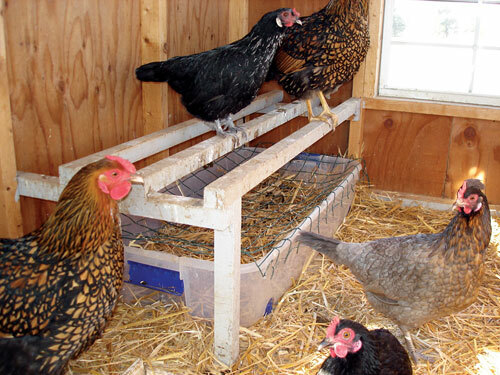 Boredom busters are an important chicken coop feature, especially in the winter when chickens tend to be less active and require more mental stimulation. 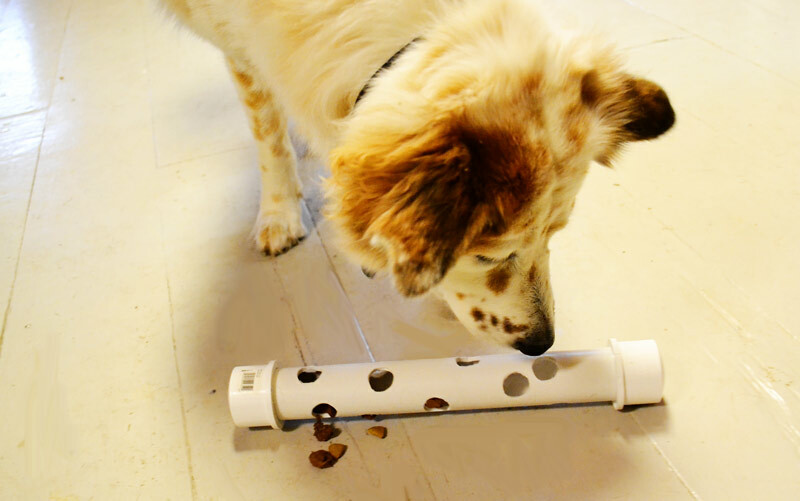 Dogtipper shows step-by-step instructions to make your own treat feeder. It requires minimal supplies to manufacture and it would be a great way to use left over pieces of PVC pipe. Fill it with healthy and nutritious treats and watch your chickens have a ball with it! 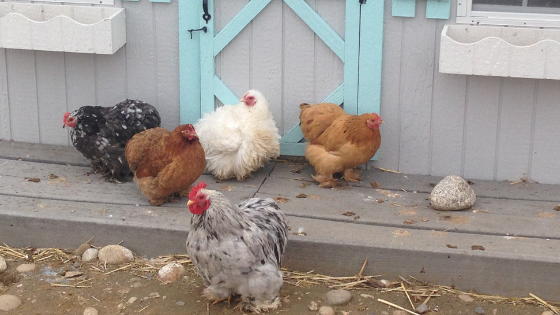 I can’t wait to incorporate all of these genius hacks into my personal chicken coop! And speaking of my personal chicken coop, next week I will be giving you guys an exclusive tour of my chicken coop and sharing the hacks we have used to make our chicken coop functional, safe, and fun! You don’t want to miss this! Stay up to date by following us on Facebook and Instagram so you don’t miss a thing! Oooooh! You are gonna have a fun weekend! 😄🐔😄 So glad you enjoy the ideas! thanks for inspirations, keep em coming!